The properties of VK-98 epoxy film glue and its application for binding multilayer (honeycomb) structures (wing panels, wing mechanization elements, etc.) manufactured by molding jointly with coverings made of prepregs based on VSE-1212 binder are presented. 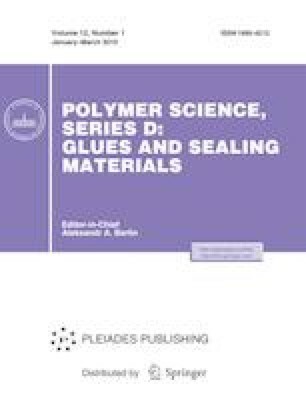 The study of the kinetic parameters of the curing process of VK-98 glue and VSE-1212 binder showed that the gluing and molding processes of PCM items containing these materials can be performed by a single technological cycle. It was established by DSC that the pot life of VK-98 glue is no less than 15 days at room temperature. It was shown that glued joints of VKU‑39 carbon plastic based on VSE-1212 binder after the effect of both artificial tropical conditions and salt mist almost do not change their strength, while VK-98 glue can be used in the temperature range from ‒60 to +120°C and for a short period at 150°C.